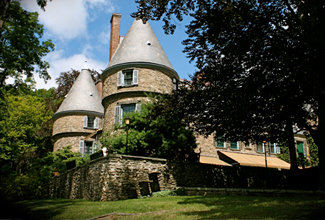 Grey Towers is located in Milford, Pennsylvania near the junction of New York, New Jersey and Pennsylvania. Take Interstate 80 West to Exit 34B (Jefferson, Sparta). Proceed on route 15 North to route 206 North. Continue on Route 206 North until you reach the bridge over the Delaware River into Pennsylvania. After crossing the bridge, bear to the right and follow the signs into Milford. Go straight ahead at the traffic light (the only one in the village) and proceed 3 blocks. You will see the Key Foods supermarket on your right. Just past the Key Foods parking lot, there is a left hand fork in the road (Old Owego Turnpike). Take this fork traveling behind the Apple Valley restaurant and shops complex. The entrance to Grey Towers is about 1/4 mile on the left. The directions to Apple Valley Restaurant will also show up on the GPS. Follow the directions above to Grey Towers. If you enter Grey Towers or Grey Towers National Historic Site, directions will NOT show up. Directions will NOT show up if you enter address of 122 Old Owego Turnpike. 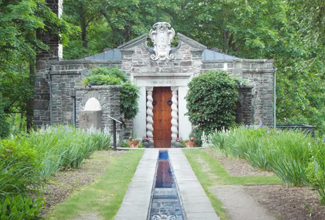 The public is welcome to visit Grey Towers National Historic Site for guided tours of the mansion and garden. The grounds are open from sun-up to sun-down year round. The grounds are open from sun-up to sun-down year round. The Landscape Tour brochure provides an overview of prominent features on the grounds. 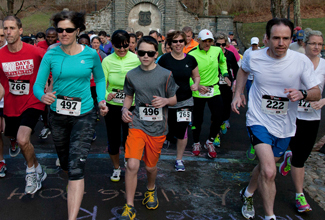 Grey Towers' hosts numerous indoor and outdoor events for folks of all ages throughout the year.